Top 3 bread slices with half the cheese, the turkey, prosciutto and peppers. Top with the remaining cheese and bread slices. Heat the panini maker. Add the sandwiches in batches and cook for 5 minutes or until lightly browned and the cheese is melted. 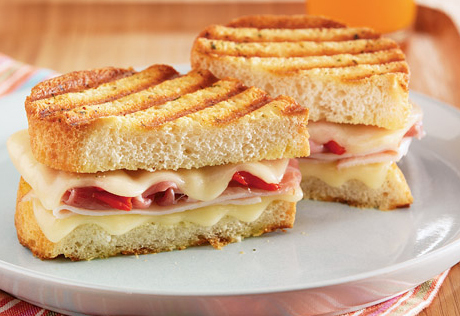 Alternate Preparation: If you don't have a panini maker, you can use a grill pan or a skillet. Heat the pan over medium heat. Add the sandwiches in batches and cook for 5 minutes, pressing down on the sandwiches with a spatula, until they're lightly browned on both sides and the cheese is melted, turning the sandwiches over once halfway through the cooking time. You can also weight the sandwiches down with a foil-wrapped brick or a cast-iron skillet instead of pressing down with a spatula. Flavor Variation: For a spicier flavor, sprinkle a dash of crushed red pepper flakes on the cheese when assembling the sandwiches.